Kitchen remodels are expensive, especially if you choose to gut and replace the cabinets. 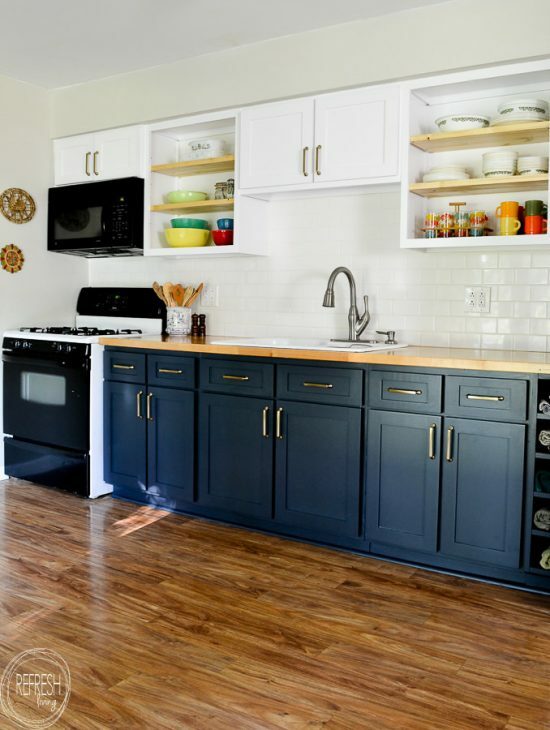 To save a lot of money, you can simply replace your cabinet doors with solid wood doors and completely upgrade the entire look of your kitchen. This tutorial describes how to reface (replace the cabinet doors) and paint your kitchen cabinets for a modern new look. This post is sponsored by cabinetnow.com, however all opinions and ideas expressed are entirely my own. Let me start by introducing you to this kitchen. It’s the kitchen in our small lakehouse cottage in Wisconsin. The kitchen is original to the house, which was built in the early 1970s. I’ve been visiting this house since I was eight years old, and about seven years ago my husband and I purchased it from my grandfather. We wanted to keep it in the family for our kids and nieces and nephews to enjoy as my sisters and I did growing up. Although it’s amazing to have this getaway in a beautiful location, the inside of the house showed its age. 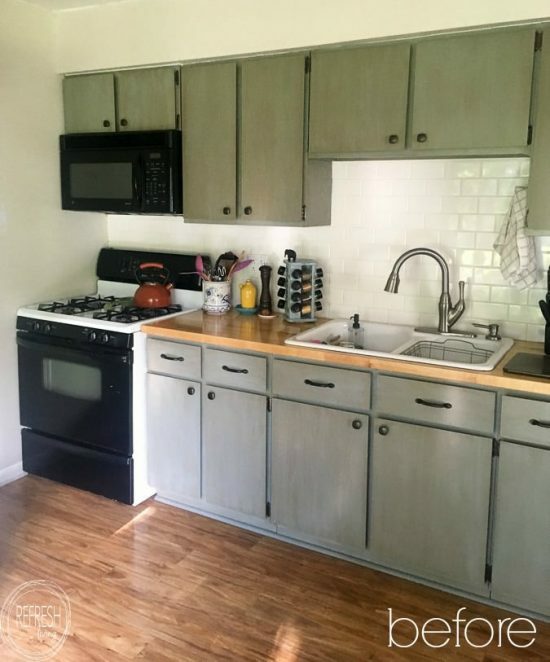 My budget was very tight when we first bought the house, so I updated the kitchen for $500. Basically, I simply painted over the faux wood laminate cabinet doors. (Why I chose to use a dark, streaky glaze, I do not know.) All along, I knew I ultimately wanted to reface the cabinets. Should I Replace the Doors on My Kitchen Cabinets? There are a few factors that you should consider if you’re thinking about refacing your cabinets. 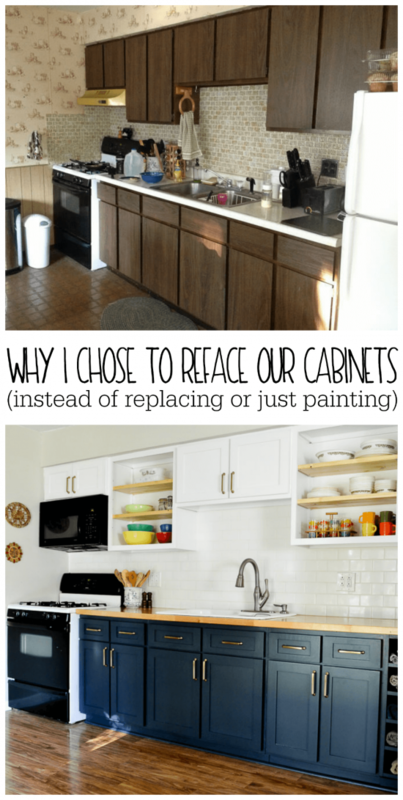 If you agree with these statements, then refacing your cabinets might be the best option! My cabinet boxes are in sturdy condition. I am happy with the layout of my kitchen. I’m unhappy with the look of my cabinet doors. My cabinet doors are not solid wood. All of these statements were true for me, so I teamed up with cabinetnow.com to replace my ugly cabinet doors with new, solid wood doors, and completely change the look of my kitchen! Clearly, my cabinet doors were not solid wood. They were two laminate pieces with a woodgrain texture that were stuffed with corrugated cardboard. I kid you not. Yes, they were ligthweight, but besides that, I can’t think of another positive to these 1970s gems. If you Google search “cabinet refacing”, you’ll see a lot of “all-in-one” facing services pop up. Basically, they come to your house, measure your doors, and replace them for you. 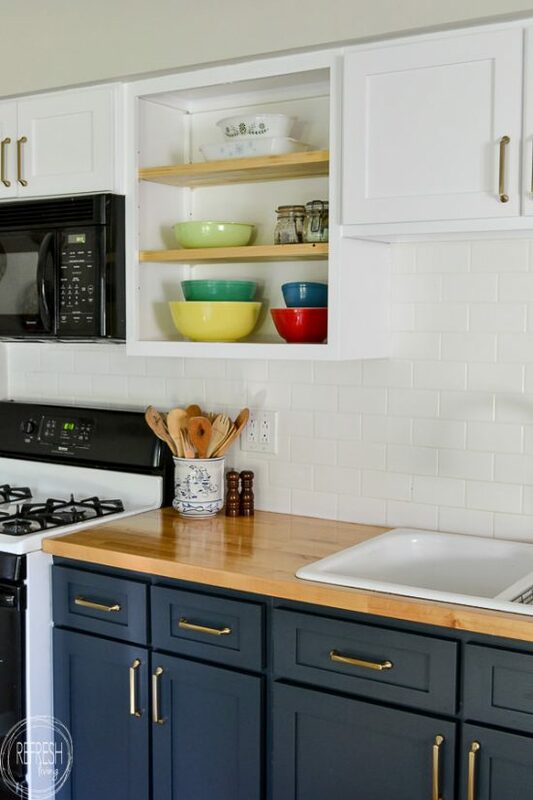 If you’re looking to refinish your kitchen without spending a lot of money, and you have some basic DIY skills, this option is not for you. Instead, you can order your cabinet doors online and install them yourself (or hire a handyman to do so). 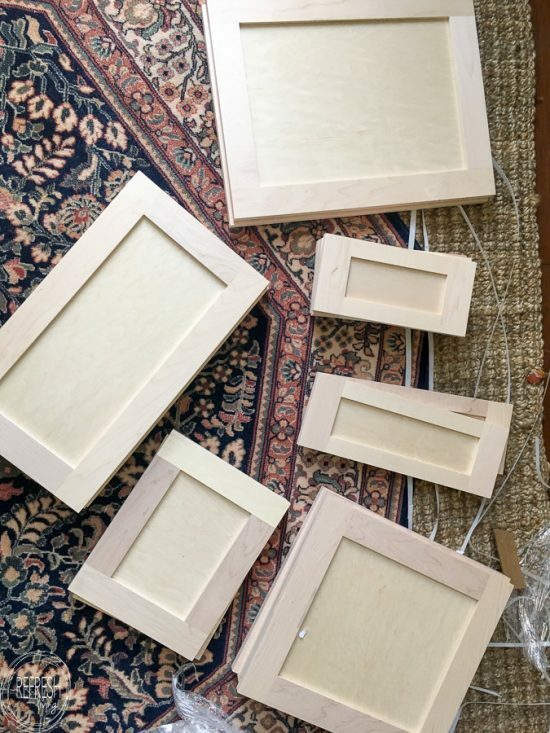 Cabinetnow.com offers unfinished, made to order, cabinet doors, drawer fronts, cabinet boxes, and replacement drawers – basically everything you need to update your kitchen, DIY style! The process for ordering your cabinet doors online is simple. First, you choose the door style and wood species for your doors. I ordered Shaker doors in maple. 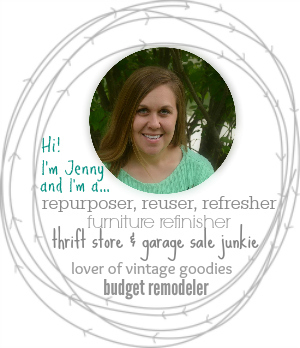 Just measure your pre-existing cabinet doors and enter the dimensions on the website. You can also change the edge option and/or get pre-bored holes on the back for hinges. That’s it! Once you submit your order, your doors are custom made and shipped right to your door. I was amazed (and very grateful) for the level of care that went into packaging the doors for shipment. They arrived in beautiful condition – so beautiful, in fact, I felt very guilty that I was going to be painting them! I primed and painted the cabinet doors with a paint sprayer, and brushed the frames with primer and paint as well. I will write a detailed post about how I prep and paint kitchen cabinets soon. For now, let me show you how this little kitchen turned out. Don’t they look like entirely new cabinets? And, if I do say so myself, don’t they look gorgeous?! I chose to create a more open look to the cabinets by completely removing the doors from two of the upper cabinets. Then, I used a circular saw to cut out the middle stile of each one, and painted the interior frame to match the outside. 5/4″ pine boards became the new open shelves and I now have a place to display all the vintage kitchen goodies left from my grandparents. I painted the bottom cabinets in Advance Alkyd paint from Benjamin Moore in Polo Blue. The upper cabinets were painted with Behr Akyd paint in white. Both paints were a satin finish. I purposely used two different brands of paint because I wanted to compare both products. I’ll write a detailed post comparing the two soon! The hardware brought the whole space together, and I love the look on both the lowers and uppers. The pulls are all the 5″ Octo Pulls in soft brass from D. Lawless Hardware. They also carry a 3″ and a 3-3/4″ inch pull, if you’re looking for something a tad bit smaller. I’m still trying to figure out what I want to do with the fridge. I’m thinking of possibly painting it with black chalkboard paint to more closely match the stove and microwave (and give a fun canvas for the kids). Or, I was thinking about purchasing 100s of those little 2″ x 3″ plastic photo magnet holders and leaving our little Instamax camera up there for fun lake and boat photos. But, that sounds like a lot of film and thus a lot of money, so we shall see. I’m super pleased with the results and think it looks like an entirely new kitchen! I have been wanting to do this for a long time. Can’t wait to see your follow up post on how you did it. Turned out great! Your lake house kitchen looks wonderful! I love the contrast between the blue and the white. Thanks for sharing at Snickerdoodle Party. I’ll be featuring this at today’s party. Hope to see you there. Amazing transformation! 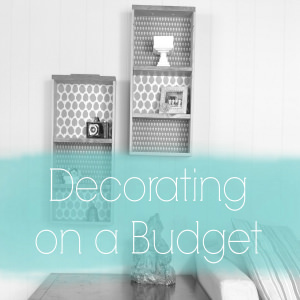 Great idea saving money and the results are wonderful. This is so gorgeous! I love the Polo blue! The pulls are also so pretty! I just love everything about this! Haha! 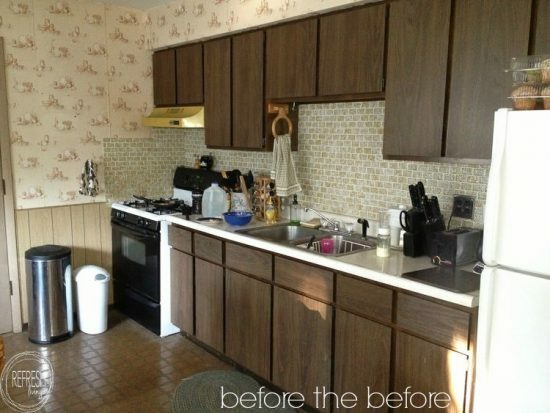 What a great difference refacing the cabinets made. It looks fantastic. Wow! This is a wonderful transformation. I had no idea that you could order new doors online! Congratulations on the Feature at To Grandma’s House We Go. I love how you kitchen turned out. You did a fabulous job. I really was shocked at the inside of your original cabinet doors. Thank you for sharing. 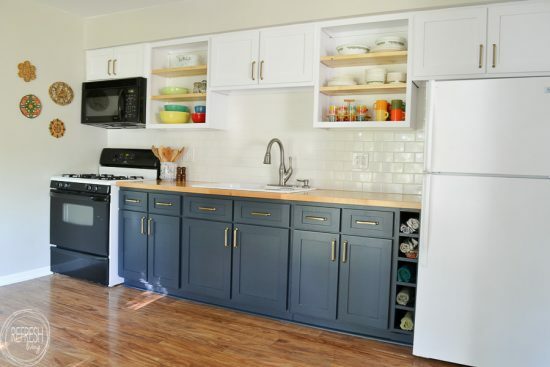 Gorgeous kitchen cabinet redo, but will never understand open cabinets! Who wants to see dishes, mugs, assorted bowls, spices out in the open?? UGH!! Haha – I understand. Honestly, my decision was partially to save money! Thankfully, I can easily add doors should I change my mind since the cabinet boxes are still in tact. Maybe you already tackled the fridge, but I know you can buy a peel & stick black chalk board surface for walls—so perhaps you could wrap the front with that instead of painting. Would love to know more about the Behr vs. Benjamin Moore outcomes, and how both of the paints are holding up. Thank you for posting this article. This is a project planning for at this time. Thank you! I’m working on that post right now, and I’ll be sure to link to it in this post as soon as it’s done! Hello!!! When buying the shaker doors did you buy them pre drilled or did you just use the previous hardware you had and drilled your own holes for screws? Hi Mandee. 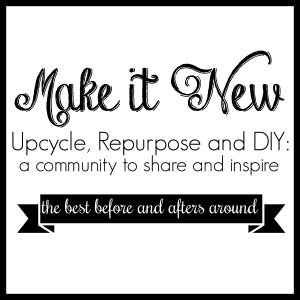 I’m actually working on a post with that information right now, because I realized I left quite a bit of details out of this post that might help people with this process! I had the holes pre drilled when I ordered the doors, and bought new hardware (because I wanted to have hidden hinges rather than the ones that screwed on the front of the cabinet faces like my old ones). There is an easy to use tool that Kreg makes to easily drill the cup and dowel holes, but I was glad I ordered them pre drilled. Your kitchen is a similar size as mine and I’m basically looking at doing the same thing–shaker cabinets, two tone, butcher block (on one side of my kitchen). 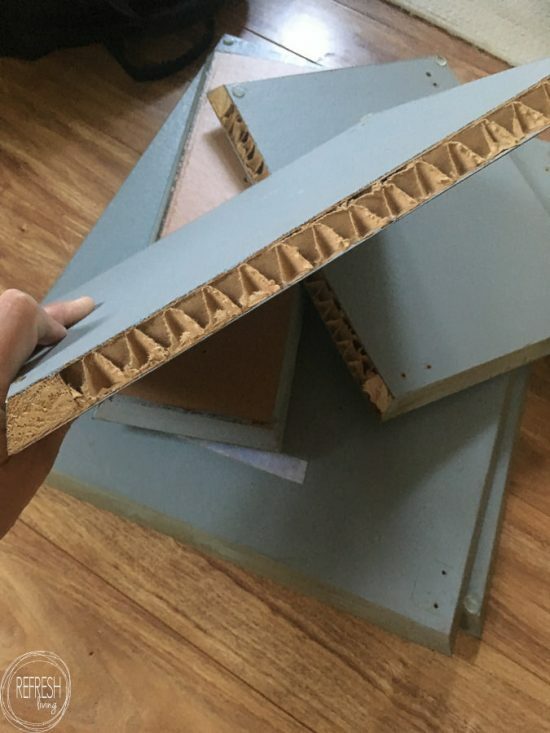 What was the cost of just your shaker cabinet fronts and how many were there in total? Just trying to get a ballpark on this option. Thanks! Hi. Good question. I had 6 drawer fronts and 12 cabinet doors and the cost of these was about $900-$1000. 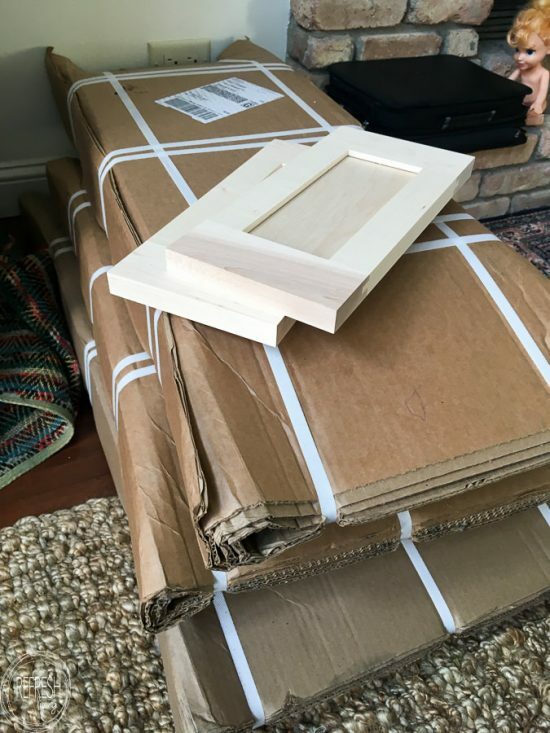 I ordered paint grade wood doors in Shaker style (which kept the cost down), but did have them prebore the holes which cost about $75 extra for all of the doors. I hope that helps a bit. Have fun on your project! I am curious about your backsplash. It looks different, what did you do? I took out the old backsplash and put up subway tile. 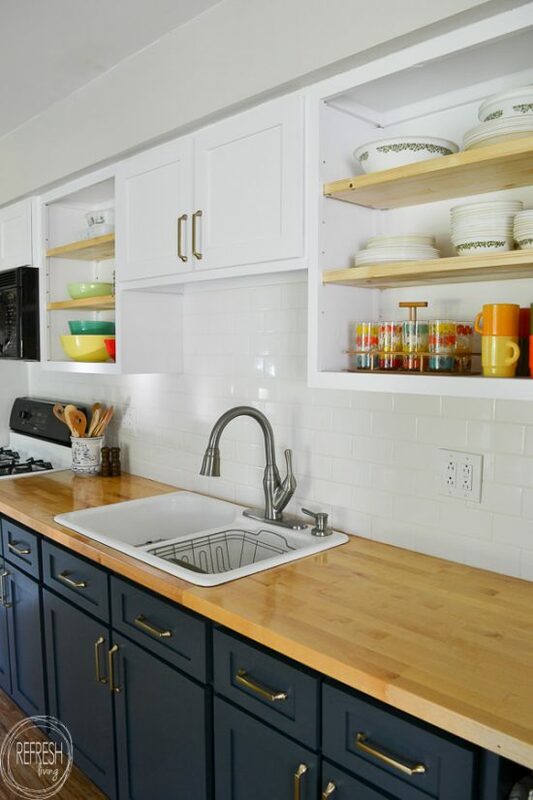 Thankfully, subway tile is pretty inexpensive (I often see 3 x 6″ tiles on sale for $0.15 each), but if it was out of my budget, I probably would have used tile resurfacing paint to just paint the old tile. Love the cabinent! But, I’m curious about the tile backsplash. Is that peel and stick or did you retile? I did re-tile it with a white subway tile. 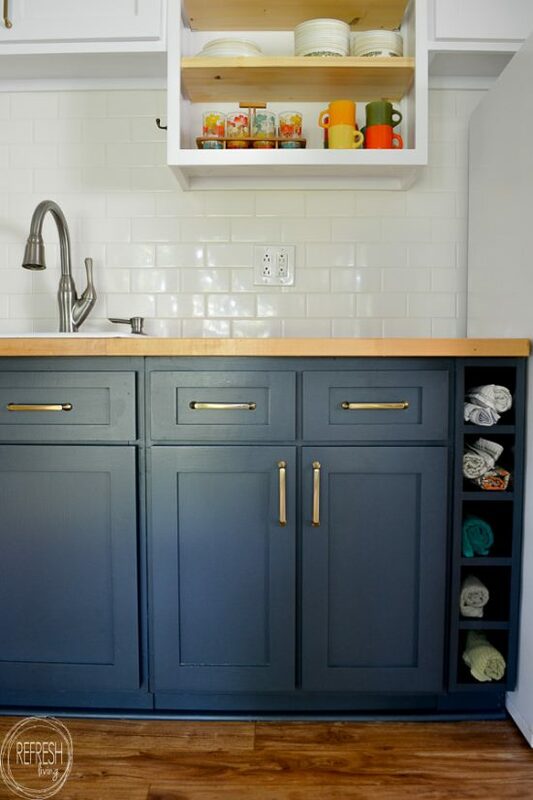 Hi, I am curious if you used a top coat on all the cabinets after you were done painting? Hi Mikki. I didn’t use a topcoat. One of the perks of alkyd paint is that it gives a super durable finish as is! Another question. You said you chose maple. I see where is two choices for maple. Did you use just maple or natural maple?